All of my other 'devices' seem to have registered the time shift correctly, but Bodhi remains on 'winter time'. Is my Bodhi 5.0 installation lacking something, that might fix this? I'm trying to make the change manually, but can't find where to increment the hour setting. I'm seeing all sorts of other options (changing the day the week begins, date and time formatting options, and so forth) but nothing about the option to change the time itself. Last edited by RonCam; 04-04-2019 at 05:38 AM. I've done the mistake of setting it to CET or GMT+1, which is incorrect in the summer time. Possible to manually set date and time, from within Moksha? Thanks to both for the rapid reply! I think I should do both. On the other part of my question, is there somewhere in Moksha where one may make a manual time adjustment? I was looking for something similar in Moksha, but couldn't find it. Maybe I'm lacking a special Module? Any advice? 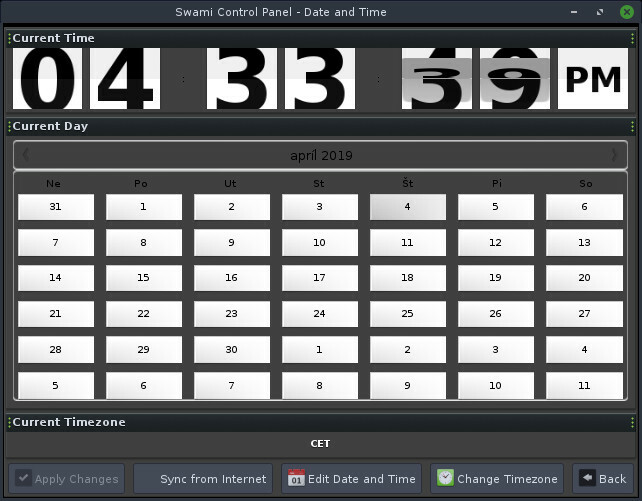 I don't know Bodhi either but while ntp keeps the system clock synced to UTC it is the timezone setting that converts UTC to local time and the timezone database for your timezone that contains the dates that switch between standard/winter and daylight saving/summer time. Either your timezone is not set correctly or the database is not correct. You can always use the command line date utility to set the system clock and hwclock to set the hardware clock. Last edited by michaelk; 04-04-2019 at 06:36 AM. Oddly enough that happened to me in my recently installed Slackware. When I noticed that the clock had not gone forward, I used hwclock --debug --show to find out what time the hardware clock was actually showing. This showed that the clock was correct (it was set to UTC) but that the system had not made the summertime correction and was still showing exactly the same time as the clock. That meant it was a time zone error. I checked /etc/localtime. It turned out to be a link to GMT (Greenwich Mean Time) instead of to London. Obviously a careless mistake during installation. We all make them! In addition awhile back a member's country had changed the dates but appeared not have sent the changes to IANA which maintains the timezone database. in my bodhi 5 64-bit apppack install i found it under settings -> system -> time and date. i am still poking around in 32-bit, but haven't found it yet. Thanks to hazel, michaelk, Guttorm and the waiter, I now have several things to check and info on how to troubleshoot this. Unless I hear otherwise, I'll assume Moksha doesn't have a facility similar to the one I described, that KDE (and other desktop environments) have? I thought, it must be there, but hidden away in some unexpected location? Thanks for jumping into the thread while I was replying to the earlier responders! I have 32-bit, and in the Main Menu, there is no 'System' submenu entry under 'Settings'. Am I correct, the AppPack release is 64-bit only, so I do not have the option of installing that. Could whatever it has to give that extra menu selection be installed, by me, into the 32-bit Legacy release? Last edited by RonCam; 04-04-2019 at 07:36 AM. in my 32-bit i have a System submenu when i open the settings panel to full screen. with my screen resolution, the last submenu at the top right is "Extensions". after i click on that, there is a small arrow just above and to the right of the word Extensions. pressing that twice moves over past the Preferences submenu and lands in the System submenu. there is no date and time there in mine however. Many thanks to cordx for the detective work. I'll back-up the system first, then give it a try. Then, revert the system if I see no advantages from the apppack installation. And, I thought that AppPack was just one of the releases ... my mistake! You should find the System-Settings under Menu-Applications-System tool and open the quick launcher and start typing Swami. Here is the dialog with time settings. i forget swami for everything other than adding a script to autostart anymore. it seems like it would be helpful to have that either in the system tools or somewhere in the settings panel.